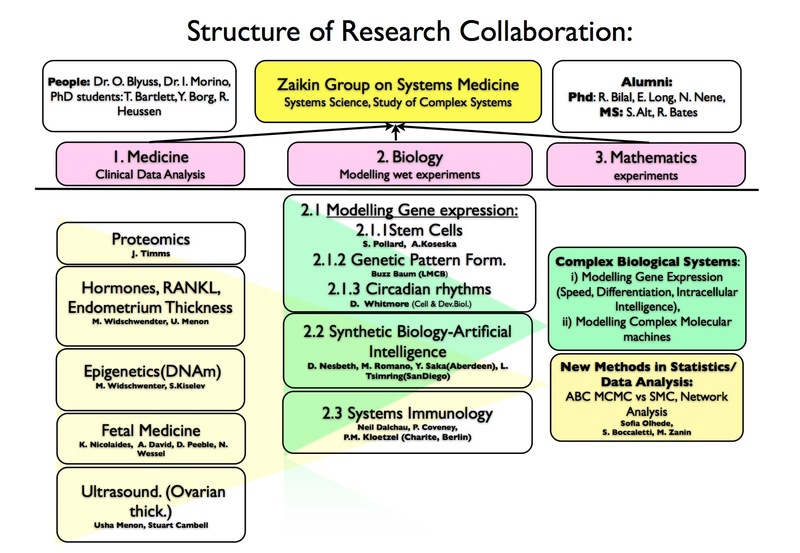 You are welcome to the webpage of Systems Medicine Group! Here we describe the details of our research, for the general approach go to " Intro". Investigation of complex genetic dynamics in genetic networks, with applications to Synthetic Biology, Circadian Oscillators, Stem Cell differentiation and genetic pattern formation. We have found and interested in several new effects or genetic systems: distributed genetic classifiers (97), intelligent and noisy genetic perceptrons (91, 98), speed dependent cellular decision making (78, 80, 83), timed cellular decision making vis cell-cell communication (70), multistability and clustering of genetic oscillators (63, 62, 69, 60), quantized time production cycling time in gene networks (59). Modelling complex molecular machines - proteasomes, and finding new methods to detect proteasomal splicing (73, 67, 68, 71, 58, 57). Modelling complex bone dynamics (66, 48, 49). Investigating new noise induced effects: doubly stochastic effects (34), doubly stochastic resonance (22), vibrational resonance (43, 42), oscillatory amplification of stochastic resonance in excitable systems (40), doubly stochastic coherence (37), noise-induced excitability (36), systems size resonance (35), noise-induced propagation (32), and noise-induced transitions (24).